On Monday, November 26, 2018, five brave teachers came to Perkiomen Valley High School in various animal costumes as a part of Take Action’s fundraiser for the Humane Society of the United States. Take Action is a club that urges Perkiomen Valley to help the environment by becoming more aware, donating, volunteering, etc. Their annual fundraiser raised $450 this year. 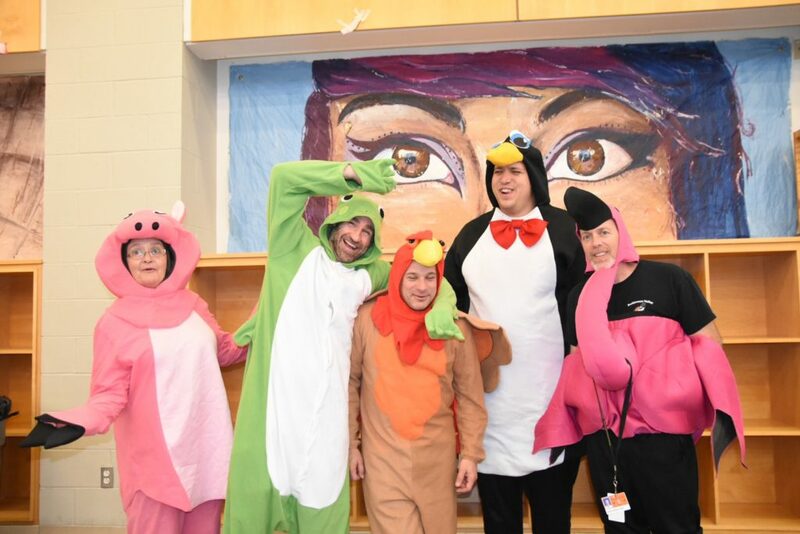 The teachers chosen for the fundraiser were Mrs. Crescenz as the pig, Mr. Hinkle as the penguin, Mr. Hunsicker as the turkey, Mr. Overholtzer as the flamingo, and Mr. Sullivan as the frog. Throughout the week leading up to the day of the fundraiser, teachers throughout the high school volunteered to wear an animal costume and the students and staff of Perkiomen Valley High School quickly donated and voted. Each voter paid twenty-five cents for one vote or chose the option of donating a dollar for five votes. The teachers with the most votes, listed above, were chosen and wore their costumes the day students returned from Thanksgiving break. All of the teachers chosen were happy to help the Humane Society, a group that aims to help animals in need. PV’s The Voice also asked each teacher what their spirit animal was, since they were dressed in a variety of creatures and might have needed to channel them. Mrs. Crescenz responded with, “My spirit animal is a wolf but I love all animals.” Mr. Hunsicker responded as well, citing his spirit animal as a tasmanian devil. Costumes aren’t always comfortable and these five teachers, who had to wear them for an entire day, had some playful things to say about sacrificing their comfort for a good cause. Although there might have been some trouble with beaks and long necks, each teacher gave positive feedback about the event.